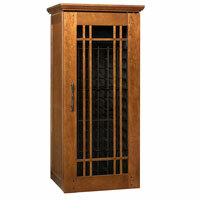 I am very impressed by the attractive appearance and quality of the wine cabinet. Several of my friends have also been impressed. The balance and leveling of the unit is very good. The noise level is about what I expected based on the literature. The doors did not need to be adjusted after removal from the shipping pallet. That was a pleasant surprise. There were a couple of negative items. First the unit does not hold 172 bottles. After reading the manual and recommendations for the unit, it holds 150 bottles. Also the unit (after reaching temperature, cycles cooling more than I believe it should; several times per hour. When I first ordered the unit I asked about a bottle temperature probe. The sales man knew nothing of this but said he would investigate. When I asked later he had no update. Upon reading the manual that came with the unit, I found the manufacture offered a bottle probe option and my cooling unit supported it. I then ordered it from the manufacture. Once I installed it, the cooling cycling issue became a non issue. There was also an issue with the door lock. With the guidance of a locksmith, I was able to get it fixed and it is useful. I do not believe the manufacture ever tested the lock to verify its functionality. The shipper was not trained in the installation of the unit. The manual stated it should take 30 minutes and it took two hours. It does take two people minimum to install the unit. I have a 1400 model, one of the smaller units. The shipper was only partially prepared for the installation. They had no level, screw driver, etc. for final installation. I paid for this option. It was advertised as trained personnel for installation. They installers were good guys but had never installed or been trained for wine cooler installations. All issues listed above were resolved and the unit is working as planned and expected. I would recommend this unit to my friends and family. I would highly recommend a bottle temperature probe for the unit.